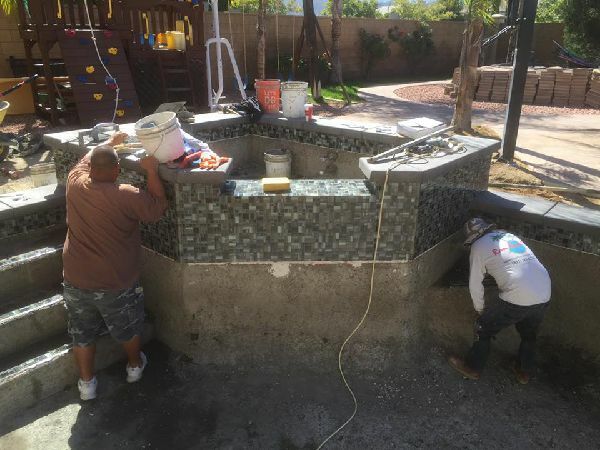 Depending on what Aloha is doing for you will determine your process, but here is a general outline when a pool/spa are included in your project. The process begins with a general design. The owner meets with you at your project location to determine with your help what will be the best use of your space. 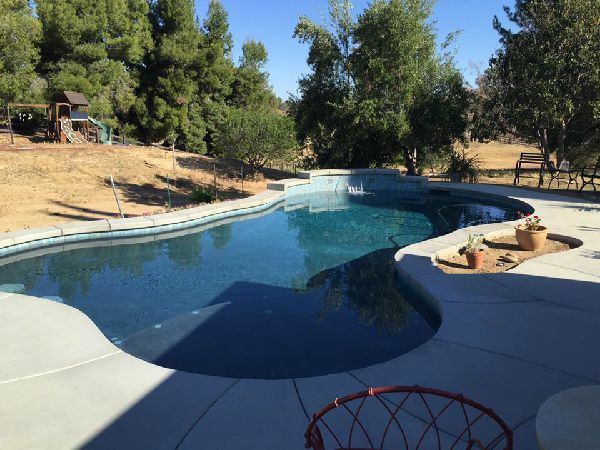 There are many facets that come in to determining a pool/spa that will work for your special family needs as well as an over all design that will work with how you intend to utilize your space. 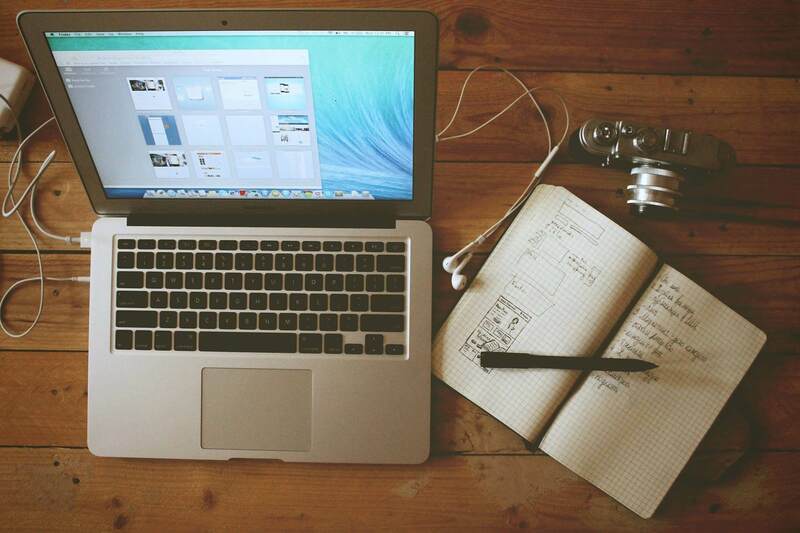 After the initial meeting, the owner will draw up a sketch for you to get the creative process going. There will be a second consultation scheduled at your convenience to go over the design and attach any pricing that goes along with the project. Once the process of design is completed, the project start date is set and the contract for services is agreed upon and signed. 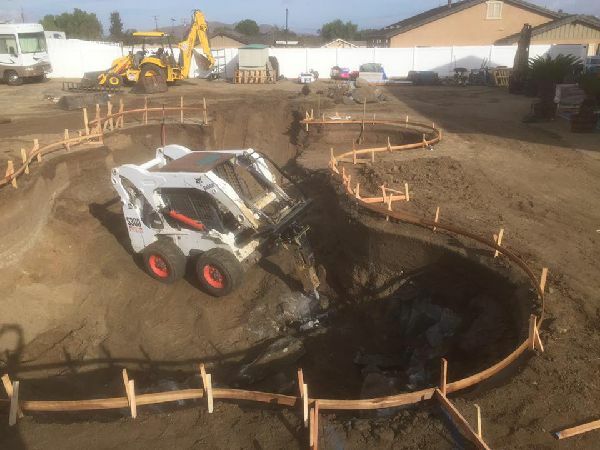 The excavation of the pool/spa is usually the first order of business unless there is any demolition required.. 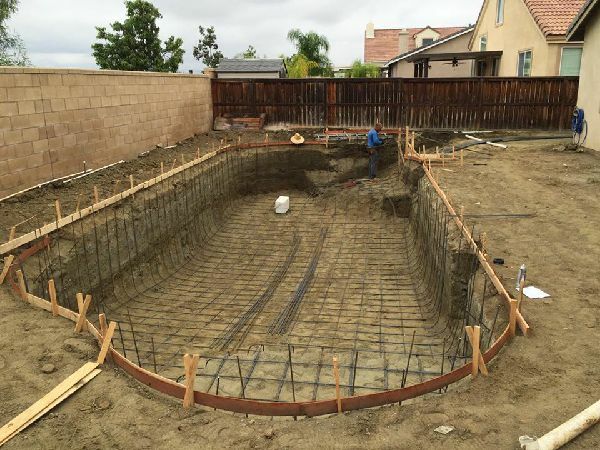 The steel reinforcement of the pool/spa is then placed around and inside the pool hole. Plumbing of the pool/spa is the third item on the agenda. This is the time that the equipment is set as well. You the homeowner have the opportunity to provide our plumber with any specifics you may desire like the placement of the therapy jets in the spa in locations that will best suite you. 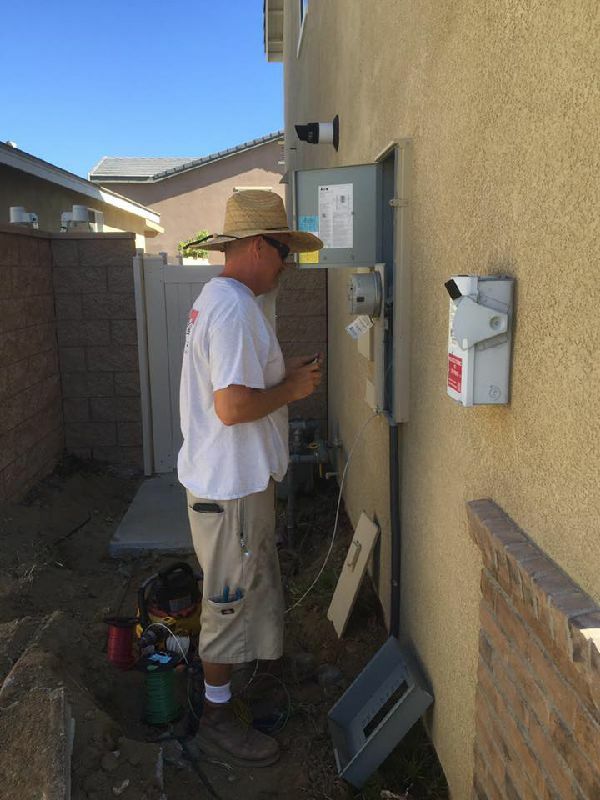 Our electrician pulls electricity from your existing panel and hooks up the sub panel at the equipment location as well as running all necessary electrical hook up lines. This the one of the “Big” days. 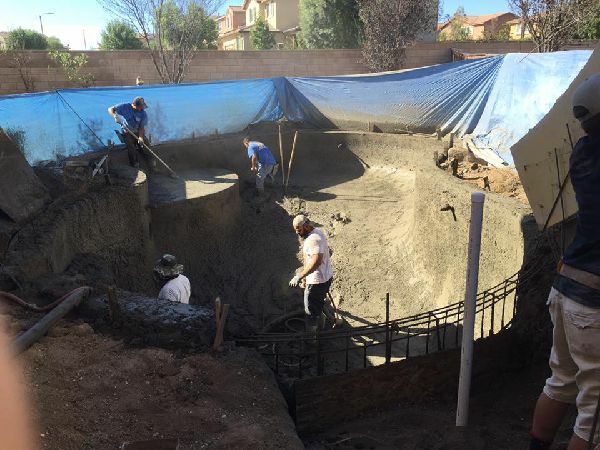 This is when we shoot your pool with “shotcrete” to forms it’s shell. 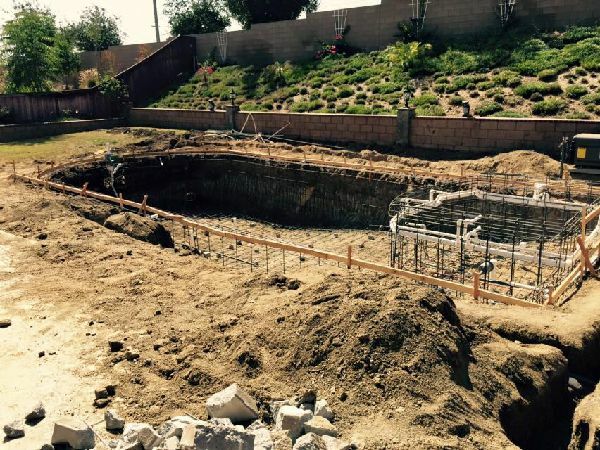 This is when you really can see your pool and envision what it will look like. The shell then is watered down several times a day by the homeowner for the period of 7-10 days. Once the shell is cured, the coping of the pool is installed. Once the coping is in, the tile is then set underneath the coping. This is when the drainage (if applicable) and decking goes in per the plan. The decking also needs to be watered for a period of one week to help in it’s curing.. This is usually the best time to install the landscaping as the pool is not plastered yet. This allows for any mess that may occur to not fall into a freshly plastered pool. 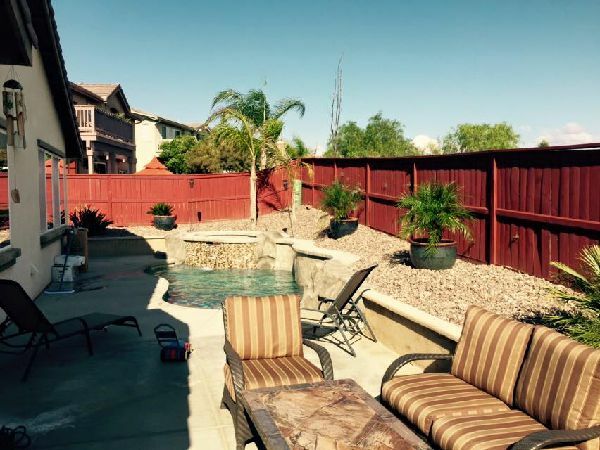 Landscaping can be done any time after the pool is finished as well if that is preferred or if a homeowner is performing that task themselves. 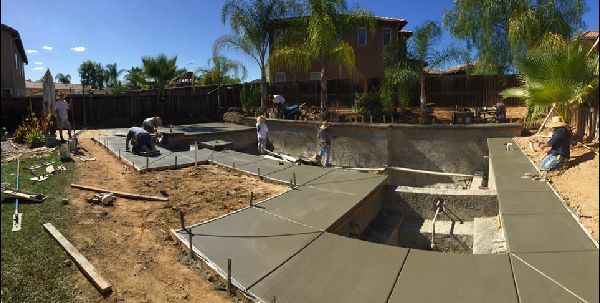 Plaster is the last step to completing the pool. 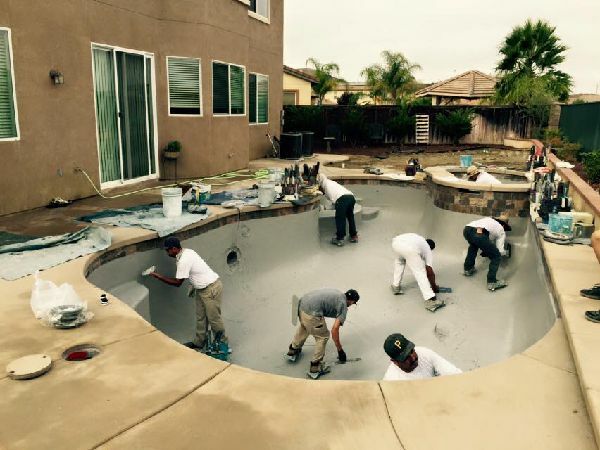 The day of plaster is the day the pool begins filling with water……you’re almost done!! Once the pool is plastered and completely filled with water, we set a time with you to come out and get the pool going. We set the programs for the pool as well begin to get the pool chemically balanced and cleaned. We also begin the process of teaching you how to operating and care for the pool. We then come out for the next four weeks to get you off on the right foot with the care of your pool. We continue cleaning and caring for your pool while teaching you how to do it at the same time. That’s it….you are swimming. It usually is about 5-7 days from time of completion .